The hardest part about doing a "Feign Death" convincingly is learning how to make the right smell. It takes a lot of commitment. crazy with the new goblin bombs!! Boommaster Flark says hi. Be seeing you in wild some time soon. I used this card on Pyros, and it killed him. Is that supposed to happen? Pyros' deathrattle reads "Return this to your hand", meaning that when you trigger the deathrattle pyros is returned to your hand as a 6/6. Yes, it should kill him. I love this card and it's one of the reasons I like to play wild. I made a deck some months ago and updated it with MSG. This cars is fantastic in Deathrattle hunter with the additions from Whispers and Karazhan! I also put an Anubisath Sentinel in my deck just because it's Deathrattle is crazy powerful with this! It's effectively a 5 mana 10/10, and if you also have a Savanah Highland or infested wolf on the board as well you can end up with a 5/5 hyena or 4/4 spider, not to mention the fact that you'll still get a second buff when the Sentinel actually dies. Me- as Deathrattle hunter (turn 3): Use Hunter's Mark on Deathlord and killing off with my token minion.... Deathlord summons my Sneed's Old Shredder... :0 :0 :0!!! Still have two mana left... luckily already have Feign Death in my hand. Do it work well with Baron Rivendare?? Most use I got out of this card was a Mage Spellslinger'd this to me while I was playing my Deathrattle Rogue. I had an Egg and a Raptor already going into turn 4 when I got this, and added another Egg. It didn't go well for him. i just got this card... was hoping to find a deathrattle deck for it...but apparently it just doesnt work. You sir, are about to amazed. This guy created a PERFECT deck that utilizes 2x of this card and is consistent. He also claims he got to legendary with it. I personally took out 1 unleash the hounds and stuck in a Mad Scientist. A few of my game swingers came from having mad scientist down and able to active it with feign death for 2 extra secrets. Not only does this gives you 2 card draws, it thins your deck for the cards you need. that's pretty cool. i only have 1 Feign Death.... and no Steamwheedles.... should be able to craft another Feign later this week. ive tinkered around with it a bit. I got the dream...... played sneed. He had no hard removal and played Chromaggus as a response. next turn i played Sylvanas + Feign Death. Stole Chromaggus and Sneed gave me Emperor Thaurissan. keep in mind... i dont ladder climb....i bum hunt at Rank 20 for easy gold and Quest completion. 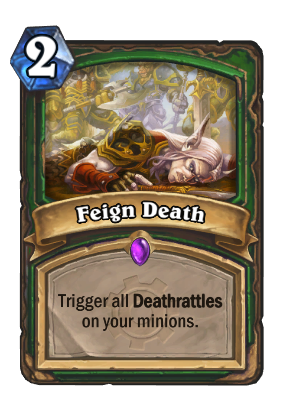 I have to try playing deathrattle deck with two copies of this card, I wonder how good would it be. There is a lot of mech with good deathrattles and some Naxxaramas cards that will synergize well with it. Rank 20 -13 currently with it, but I'm hitting brickwalls now.